Can F-Secure go toe to toe against the likes of Kaspersky and Bitdefender. Provides many banking protection features to thwart man-in-the-middle cyber attacks. F-Secure Internet Security is a complete antivirus security product that offers excellent protection against malicious URLs. It can block the majority of such URLs with ease. However, it succeeds to counterbalance that excellent performance with mediocre independent lab scores along with poor ransomware blocking feature as well as limited parental control features. Most modern security companies now have the habit of offering multiple versions of the same antivirus product. For example, some companies have a simple antivirus as their cheapest available security product. Then they have the baseline security suite. A few offer a feature-rich mege security suite as well. Most of these suites come with multi-operating system and multi-platform antivirus protection feature. Taking that schema in context, the new F-Secure Internet Security probably falls in the baseline security suite category. And yes, it is Windows only. Users who already have subscribed to F-Secure Internet Security are pretty much set because they have the option of installing all the latest updates and upgrades. On the other hand, F-Secure has started to push out new users in the direction of its F-Secure Safe product which is actually a mega security suite. The F-Secure Safe suite comes with the same protection as of F-Secure Internet Security as far as the Windows operating system is concerned. In this review, we will try to cover only F-Secure Internet Security. For F-Secure Safe review, keep tuned to Security Gladiators assuming you want to read about how F-Secure would cover all the other operating systems and platforms. 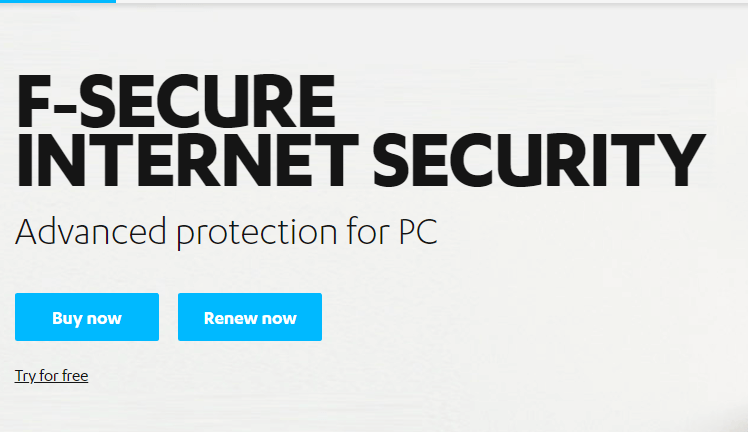 F-Secure Internet Security costs users a reasonable $69.99 for 12-months. With this subscription package, users can protect a total of three devices. We say that the cost is reasonable because that’s pretty much what other antivirus companies are charging their users as well. Elite security companies such as Trend Micro, Kaspersky and Bitdefender all charge users around $10 more than F-Secure. However, F-Secure has the edge when it comes to offering an antivirus service that doesn’t bog them down with one or two kinds of packages. F-Secure offers users a good variety of subscription packages when it comes to multiple licenses. It does that better than almost all of its competitors. For example, users who only want to sign up for a single license have to pay $49.99 per 12 months. F-Secure can go up to 25 licenses for which it charges $279.99 per year from the user. This pricing model pretty much matches the F-Secure Safe offering that has cross platform protection. With that said, users should take note that F-Secure Safe does not offer the one and two protection licenses. As mentioned before, there are many other security companies that offer users super-big subscription bundles. For example, the very reputable Kaspersky Security Cloud offers users a total of 20 licenses (all cross-platform protection) for a decent price of $149.99. There is also Norton and BullGuard that provide users with a total of 10 device licenses for $109.99 and $99.5 respectively. The official McAfee AntiVirus Plus subscription package costs $89.99 and provides users with an unlimited number of licenses. 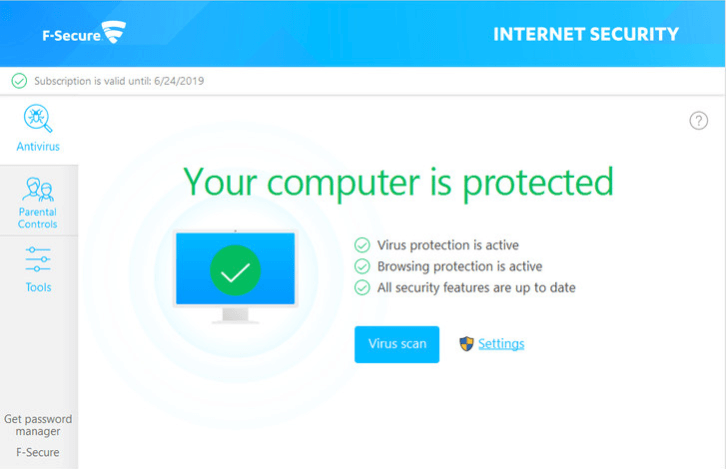 Just like the F-Secure antivirus program (the standalone offering), the F-Secure Internet Security offers users a streamlined and airy main window. Moreover, the main window also comes with a ton of whitespace. There is also a distinct status indicator which pretty much dominates the main menu window. Apart from that, F-Secure has a button on the main window which enables users to launch a quick virus scan. And as usual, F-Secure also provides a link to the product’s settings menu. Users should also have no trouble in spotting several tabs on the left-hand side of the screen using which they can switch from F-Secure Internet Security’s main window to other sections such as the tools section (or page) and the official parental control feature. One thing that users need to note here is that there is no Statistics page here. It died, in some senses. F-Secure representatives will tell you that the company has already planned to bring the Statistics page back to the product. And the page will come back new and improved. The other change that the current version has brought with it the lack of spam filter. F-Secure has dropped that feature as well. Due to nothing but a great lack of intrigue on part of the users. That should not come as a surprise to anyone. The majority of online consumers who buy antivirus products don’t really need a local and dedicated spam filtering feature. Before moving to the extra features, let’s first talk about the core ones first. Users should understand that this suite’s core features are pretty much exactly the same as F-Secure’s standalone AntiVirus offering. In other words, users should not expect any additional core capabilities when signing up for F-Secure Internet Security. With that said, we feel that there is one huge difference between this suite and the standalone offering. This suite has the capability to integrate its features with the user’s web browsers. Consequently, it keeps users clear of any fraudulent and/or malicious websites. We will go into more details about both these and other shared features in just a moment. Before that, users should know that if they want to dig into what F-Secure Antivirus has to offer, then can read our review for F-Secure AntiVirus here. As mentioned a lot of times earlier as well, at Security Gladiators we tend to follow four major independent antivirus security testing labs. We’ll talk more about them in the later sections. The reason why we have mentioned the four independent testing labs here is because all of them include F-Secure in their tests and reports. That is in and of itself quite an achievement because these independent labs don’t just pick any random antivirus product for testing. As far as F-Secure Internet Security’s scores are concerned, we’re happy to report that they are all above average. Now, the operative word here is above average. We’re not saying that these scores are great by any stretch of the imagination. Some reviewers like to make use of a simple algorithm to basically map all of the security product’s (the one under testing) scores on a convenient scale of 10 points. That also helps to generate an aggregate total score for the security product under testing. Our research shows that F-Secure scores higher than 8 and lower than 9 out of a possible 10. Using similar methods, other elite security products such as Bitdefender, Avira, Kaspersky Internet Security have managed to score just shy of 10 (considering scores only from the top four independent testing labs that we follow) out of 10. The other way to judge an antivirus product’s strength is via some good old hands-on tests for malware protection. Our research shows that F-Secure has enough about it to score around 90 percent on these tests. What does the 90 percent mark mean? It means that if users (or testers) through a 100 malware samples at F-Secure Internet Security, it can successfully block over 90 percent of all those samples. This puts F-Secure pretty much on top of every other competitor on the market as far as malware sample test scores go. With that said, users should note that the final score of any given antivirus product on a malware sample test is dependent on the actual malware samples. These samples change very quickly. So it is difficult to know if a given product would perform equally well on another set of malware samples as well. This is the reason why we recommend users to think of malware sample protection test scores as scores for one specific malware sample set. In the next batch of malware samples, F-Secure could score higher, lower or the same. We’ll have to admit that very few antivirus products have gone through the new malware sample sets. So it is difficult to say if other antivirus products have the potential of scoring higher marks than F-Secure. As mentioned just now, one can’t really compare antivirus products which go through a different set of malware samples. A direct comparison is simply impossible. With that said, perhaps readers would find it interesting that on a previous set of malware samples, Webroot SecureAnywhere along with Norton, scored a 10 out of 10 perfect score. The other thing we want to mention here is that the F-Secure Antivirus standalone edition doesn’t offer any type of browser protection. It simply does not include a component for web browser protection. Of course, the F-Secure Internet Security suite comes with the full component. However, the F-Secure antivirus standalone edition does offer new users a state-of-the-art newly-introduced advanced network security feature for more protection. Our research shows that this feature, on its own, has the ability to block access to the majority of malware URLs and websites that one may throw at it during testing. This point does not negate the fact that the implementation of this network protection feature is anything but awkward. What we mean is that sometimes users will have their web browser display a specific error message which would state that the site actually declined to display the page the user requested. But, a short while afterward, F-Secure would show a rather transient notification message which would explain to the user how the security product had stopped the user’s access to the malware site. Our research shows that F-Secure has the capability to eliminate close to 90 percent of all malware if we include the malware that F-Secure only caught and eliminated after the user downloaded the payload. Most of our regular readers would be able to tell that the score of 90 percent is pretty high. Better than the industry average. However, other antivirus products and security suites like Norton Security can manage up to 98 percent. Some, like Trend Micro, have enough about them to score around that 98 percent mark as well. As indicated earlier as well, the F-Secure Internet security suite installs web browser protection with the help of a (you guessed it) a web browser extension. Our research shows that the browser extension proved itself significantly more efficient and effective. From an overall point of view, the F-Secure Internet Security suite managed to hit the 95 percent mark as far as protection as concerned. This effectively put F-Secure right behind Trend Micro and Norton in the rankings. Our investigation shows that in the vast majority of the cases, the F-Secure Internet Security suite managed to divert the user’s web browser to another page. That page stated clearly that the security suite had blocked a potentially harmful URL and/or website for the user. Users should know that sometimes F-SEcure would describe websites as suspicious. At other times it would straight out label them as harmful. The other thing users need to know is that for the vast majority of events, the regular F-Secure real protection would have enough about it to wipe out a nasty download. Our research shows that in only 2 out of a total of 100 cases, F-Secure needed the help of its new and improved advanced network security protection feature to do the job that the regular real-time protection could not. As far as ransomware protection is concerned, our research shows that the F-Secure regular real-time protection feature should have no trouble in wiping all of it out. These are all quantities which are known, so let’s leave it at that. Ransomware is dangerous only when it comes from a zero-day cyber attack. So if a given antivirus product detects a given ransomware even after a day or an hour, it doesn’t really matter because that is enough time for the ransomware to do its work and damage its victim in a pretty big way. Is there a way to simulate zero-day ransomware cyber attacks? First, the user has to turn off the F-Secure feature called real-time protection (the regular protection). That should leave only the F-Secure Internet Security DeepGuard ransomware-specific and behavioral security components alive and working. Our research shows that the F-Secure DeepGuard comes with enough firepower to detect and then quarantine each and every single malware sample that tried to encrypt user files just after launch. In other words, F-Secure DeepGuard did not allow a single file to become a file-encrypting ransomware victim. With that said, we also have to mention the fact that F-Secure DeepGuard did not do anything to protect users against ransomware attacks such as Petya disk-encryption. One other way to test if a ransomware security product really works or not is to launch a ransomware sample at launch. Our research shows that if the user configures a ransomware sample to simply launch right at system startup, F-Secure would not even notice it completing its mission to encrypt sensitive user files. There is no doubt about the fact that such tests don’t really make use of real zero-day samples of ransomware. We say that because, the fact that someone has a ransomware sample makes it a non-zero day ransomware sample. That’s just how the definition of zero-day ransomware works. Now, all of that suggests to us that F-Secure indeed has a weakness when it comes to various behavior-based responsibilities and detection. We have already mentioned the fact that the F-Secure web browser protection feature is top-notch. And we don’t just say that for the sake of it. It blocked enough malware-ridden URLs and websites for us to give it that label. F-Secure utilizes that same protection mechanism to protect users from all the fraudulent websites. Phishing sites are fraudulent sites that mimic genuine websites like Facebook or Outlook. But instead of providing users a service, their main aim is to steal the user’s login information. Our fact-find mission tells us that F-Secure isn’t as good as protecting users from phishing sites as it is at protecting users from malware-hosting websites. In order to make sufficient preparations to test a security product for protection against phishing attacks, one has to scrape a decent number (usually around 100) of phishing sites/URLs that authentic sites have reported. The internet does offer sites that specifically track phishing URLs and then report them. But the key to testing a given security product for phishing protection is that the phishing URLs have to be new. By that, we mean that these phishing URLs, ideally, should not have been analyzed nor blacklisted. As for actual testing, it is pretty easy to do. Users can just hand code a program that is able to launch each given phishing URL turn by turn and then record the result (if the security product under testing caught the phishing URL or not). The program also makes sure to record if the antivirus missed the phishing URL or if the phishing URL didn’t actually lead to a phishing website. Many reviewers test for phishing URLs by running the aforementioned test on a total of five computer systems at the same time. First, the tester has to protect one computer system with the security product that is to be tested. Then, another system should have the protection of Norton as it is considered the gold standard when it comes to protection against phishing URLs. The rest of the three systems should have no protection. Most testers like this setup, as mentioned just now, because Norton, historically speaking, has regularly shown that it can block the majority of phishing URLs thrown at it. Since, web-browser phishing test results vary a lot, they can’t be relied upon as much as Norton. With that said, it is also true that recently many testers have noticed Norton not providing consistent protection against phishing URLs. Moreover, web browsers have also managed to upp their phishing protection game. Therefore, it makes sense to abandon Norton. And compare the security product under testing with only the three mainstream web browsers. After that, it is all a matter of averaging out the results. For comparison’s sake, users should know that the majority (about 50 percent) of the premium security products have less than a difficult time in outperforming all three mainstream web browsers such as Chrome, Internet Explorer and Firefox. Well, some studies have revealed that around 30 percent of all security products are able to beat at the very least one of the mainstream three web browsers. That leaves just 20 percent at the bottom. And where does F-Secure rank? Sadly, it ranks in the bottom 20 percent. For the end user, this means that all the three mainstream web browsers such as Firefox, Chrome and Internet Explorer only need their built-in phishing protection to beat F-Secure’s score. F-Secure had a dismal detection rate that was 18 percentage points below the web browser’s average detect rate. Previously, when testers used to consider Norton as the king of phishing tests, Bitdefender always used to have the better of Norton scoring, sometimes, a full 12 points higher than Norton. Now, with Norton out of the equation as the king of phishing protection, we have a new contender. It goes by the name of Check Point ZoneAlarm. Our research shows that it is pretty much right at the top. It has the potential of beating mainstream web browsers by a full 52 percentage points. Bitdefender can beat the average detection rate of the three web browsers by a full 29 percentage points. Users should not find it hard to come to a conclusion on their own. It is pretty clear that when it comes to protection against phishing users are better off at utilizing their web browser’s built-in phishing protection. Mainstream web-browsers usually have phishing protection enabled by default. But some users who may be using F-Secure for protection may turn it off thinking that F-Secure would protect them. Our research clearly says that users should not trust F-Secure that much as far as phishing protection is concerned. No can argue that modern online consumers need online protection all the time. But online security is never more critical when the user is busy carrying out some sensitive tasks like banking via the internet. We know of many security products that offer users an extra amount of protection in order to keep nasty spyware away from opportunities to snoop around and steal the user’s sensitive data while the user is busy in completing a sensitive transaction. To take an example, elite security suites such as Bitdefender come with components such as Safepay. Bitdefender includes this feature in all of its security offerings. Even the vanilla Bitdefender Antivirus comes with this important security feature. The likes of Kaspersky security suites offer a Safe Money feature. Kaspersky makes use of this feature in order to isolate the user-defined specific web browser from all other less important and more vulnerable processes. Avast has a Bank Mode. The company offers this mode even in its free antivirus offering. Bitdefender Safepay and Avast Pro Antivirus Bank Mode also have the ability to open up a secure and separate desktop for the user in order to provide the maximum amount of online security. As mentioned just now, Kaspersky, with its Safe Money, can isolate the user’s web browser process in order to keep it separate from all other products. It flags the user’s web browser as a sign of security with a border that is green in color. All three (Bitdefender, Avast, and Kaspersky) kick into action without any user input when they detect that the user has logged into to a financial site. F-Secure also takes the opportunity to activate its banking protection feature automatically when it detects financial sites. 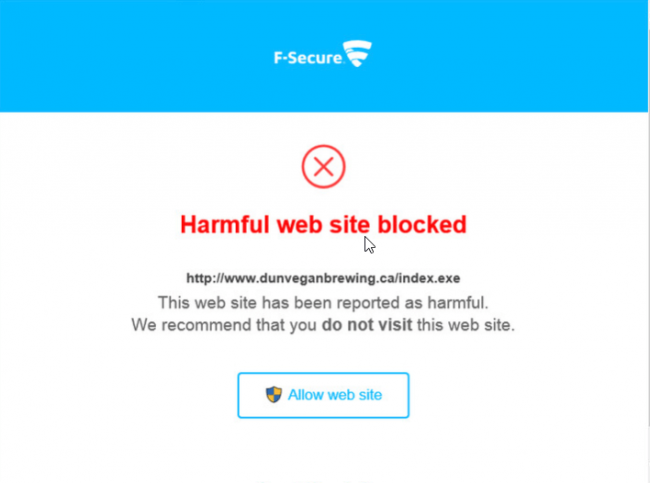 Whenever a user makes a connection to a financial website, F-Secure moves in to block all types of other connections. It also shows the user a banner which states that F-Secure has activated its banking protection feature. There are buttons on the screen as well which enable users to hide the F-secure banner. Users also have the option of ending the F-secure banking protection session if they want to. We don’t see any genuine reason for users to hide the banner. Because even if users just leave the banner where it is in peace, it still rolls up and transforms into a very thin line that appears right at the top of the user’s screen. It does that moments after popping up the message that it has started to protect the user. Our research shows that F-Secure baking protection does work. The user should see the banner appearing on the screen when he/she opens a financial/bank site. Moreover, F-Secure will also show the user an official explanatory webpage which advises the user to finish his/her financial business first whenever the user attempts to make a connection someplace other than the financial site even with a different web browser. A trojan that has come to the user’s machine to steal data would not really get the message. However, F-Secure will secure the user against such a Trojan from capturing and transmitting the user’s sensitive and/or private online data. What we mean to say is that the F-Secure banking protection feature pretty much works exactly the way the company as advertised it. However, we are having a hard time believing that it is as good as some of the premium competition in the market when it comes to the quality of that protection. It is entirely conceivable that a given hacker or anyone who is trying to steal some data would be able to capture the user’s sensitive data by simply showing patience and waiting till the user ended the banking protection session in order to send that data to a remote machine. Some of the other elite security products that we have come across and have mentioned in this review isolate the whole of the user’s web browser process. F-secure, on the other hand, only prevents other connections. F-Secure parental control feature is awkward and limited. For those who want more details, keep reading. The first thing users, and perhaps F-Secure as well, should know is that not each and every parent has a need or want to have a full dedicated parental control system in their internet security suite. Of course, there are some parents who do want such a feature. When security companies decide to offer parental control features they should make sure that they build such feature in a way that enables them to protect all devices of any given child. This condition wasn’t a must in the early days of the internet. But all modern users need this feature assuming they need the parental control feature as well. To further simplify what we mean to say, a parental control feature is of no use if it can only limit screen time for a given kid on the kid’s personal computer when the kid also has an Android smartphone and an iPad to switch to. This is where the biggest problem with F-Secure parental control system lies. The parental control system from F-Secure simply doesn’t have the capability to accomplish anything like this. In other words, it doesn’t support cross-platform parental control. The worst part, for us, is the fact that the PC-only F-Secure parental control mode also comes with some serious limitation of its own. The last version that we had a chance to research did not come with such limitations as the newer version. In order to turn on the F-Secure parental control feature/system, users have to click the tab that appears on the left-hand side of the screen and says Parental Controls. Users then have the option of clicking on a huge button that says Turn on in order to start setting time limits for the child. The button also enables parents to block any type of unwanted content for the kid. After that, parents have to confirm that they really want to use the F-Secure default settings. As it turns out, F-Secure doesn’t offer users to customize options immediately. This is the part where we have to say Congratulations to parents since (if they followed the above two steps) they have just set up for themselves F-Secure parental controls. 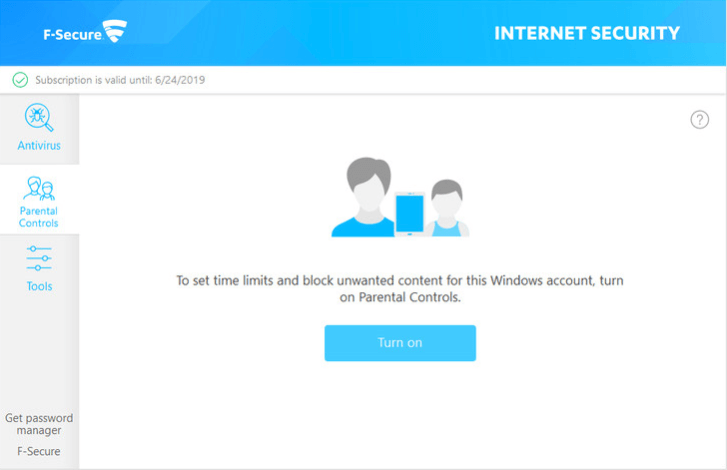 For clarity’s sake, what we want to let parents know is that there is only one way to engage in any type of configuration when it comes to parental controls that belong to a specific account on the Windows platform. That way is to first log into the specific Windows account and then continue to do whatever it is parents want to do. This is the first time we have seen such a parental control system. Users should note that the previous version of F-Secure parental control system allowed users to manage all of their protected accounts without having to fulfill the requirement of logging to each and every account on an individual basis. For the end user, this means that they will first have to log into each of their children’s account on the Windows platform and only after doing that will they have the option of turning on the F-Secure parental control system. We don’t know how hard that step is, but we surmise some parents would find it difficult to ask their children for their account passwords. Sometimes even security companies can do with a bit of common wisdom. In this case, that common wisdom comes in the form of only giving children Standard accounts as users on a Windows machine. Children should not have Administrator privileges. The other thing that users should know is that even when they have logged in to a given Windows machine as the Standard user instead of an Administrator user, they still have the option of turning on F-Secure parental controls. They will have to use the program’s default settings though. If parents want to modify the default settings by making some changes then they will have no option but to supply the relevant password to the machine’s only administrator account. Parents should not forget that in order to have the proper protection they first have to log into each account and then launch each given web browser AND then install the official F-Secure parental control system web browser add-on. Perhaps this is a good time to also mention that if parents don’t install the F-Secure browser addon they won’t have the option of benefiting from some of the parental control features. The other thing they need to note is that any of their kids, with or without a Standard Windows user account (that usually has limited permissions) will have the option of removing and/or disabling the F-Secure web browser add-ons. F-Secure parental control features do have the ability to block the child’s access to sites and URLs that belong to 15 categories. F-Secure color codes each of these categories. F-Secure blocks sites belonging to these categories automatically. Then F-Secure has a yellow-colored category. F-Secure blocks all sites belonging to these categories by default except for the Shopping category. There is also the blue realm. F-Secure blocks only the first two categories via default settings. That means, if parents do not take the time to turn off or modify parental control for their own account, they can (along with their children) forget about consuming content on sites like Facebook and Instagram. That takes care of what meets the eye from the outside. But we also want to talk about real-time performance. Our research shows that F-Secure advertised content filter is pretty solid when it comes to blocking content. It can even work with some of the least known web browsers on the internet. Users can rest assured that no matter what their kids do, they won’t have the chances of getting past the F-Secure content filter even with the use of the many available online anonymizing proxy services. We now know that not only can F-Secure content filter block regular HTTP traffic, it can also block HTTPS anonymizer. Users should take notice that F-Secure shows the same notification message both for HTTPS sites as well as HTTP or non-secure websites. We know of many parental control components that don’t have the ability to manage such a feat. They only show the user a web browser error whenever they clock an HTTPS URL and/or website. Of course, no parental control system comes without a catch. F-Secure’s catch is a pretty big one. You see, whenever F-Secure blocks a website and displays a warning page, it also shows a huge button that says Allow URL and/or Website. Parents who may have given their kid a Windows Administrator account in order to avoid all the hassling that comes with the parent getting up, going to the kid’s rom ad logging the kid in each and every time there is a problem, then the kid can simply click that big button in order to gain access to the site and/or URL. If the kid is on a Windows Standard user account, then F-Secure still shows the user the button but, this time, the user can’t just click the button to gain access to the blocked site. And while we are on the subject of Administrator and Standard accounts, parents should bear in mind that if their kid has access to an Administrator account then the kid can easily turn off F-Secure parental controls. F-Secure doesn’t provide users with a provision that locks F-Secure parental control settings with the help of a user password. As mentioned before as well, if the kid only has access to a Standard account then the kid, as hard as he/she might try, can’t have access to any settings. The default settings dictate F-Secure turning off the search engine result filer. Parents have the option of turning this feature on. If they do enable this feature, then F-Secure tries its best to force Google to use the safe search feature. Our research shows that the search engine result filter is pretty successful when it comes to preventing the child or any user from disabling the safe search option. Of course, parents will have to make sure that the F-Secure web browser extension is installed and active. As far as search engine results filter feature goes, if the kid knows how to disable the web browser extension and/or use some lesser know browser, then that’s the end of this feature. F-Secure parental control component does a good job of providing users with a thorough and detailed time limit system. It basically lets parents do the work and put a cap on the daily computer use of the child. Parents can also put limits on only internet use rather than computer use. By default, the “use” cap is around 2 hours. As mentioned just now, parents can set the time limit to any value from one hour to a total of seven hours. There is also an option of setting no limits. Apart from that, there is also a screen time system. This system is useful if the user wants to define a strict schedule for the kid with regards to each day of any given week. Users can modify the schedule with one-hour increments. The default settings (here too) dictate that the user may access the machine from 8 am in the morning to 8 pm in the evening each given day. The good thing about F-Secure time limit system is that it does not rely on the machine’s clock in order to management tasks of its defined schedule. Even if the parent has a kid that acts like a smart alec, F-Secure has enough about it to stop the child from tweaking the clock in order to have access to the internet and other things outside the permitted time. That holds true even if the kid has administrative access to the machine. However, F-Secure parental control system comes with a big loophole here as well. When F-Secure shows a time-out warning message, it also shows the user a button that can enable the user to change time limits. A kid who has administrative access to the machine can lift the time-out limits. On the other hand, if parents make the decision of locking the machine, an official F-Secure warning message completely hides the desktop. But the warning message comes with a button that says Extend. A kid who doesn’t have any administrative privileges can’t really do anything when it comes to tweaking the set time limits. 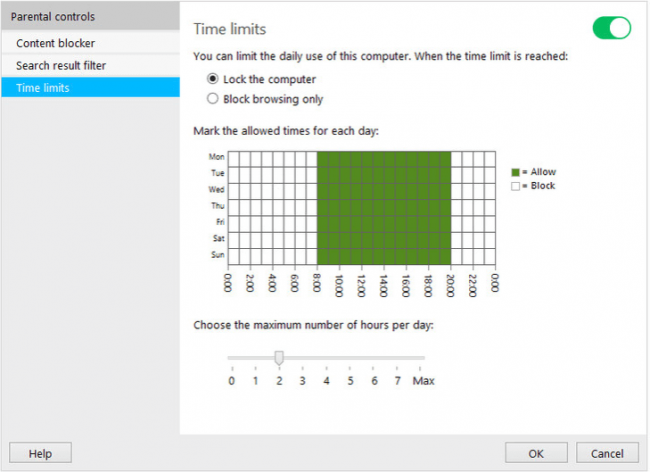 The Change button only modifies the time limits if the user happens to have administrative privileges. For a Standard account user, the button does absolutely nothing. Parents who have set a limit on the overall use of the machine, should know that if they (or the kid) click that Extend button, it will pop up a screen which would request the user for the machine’s administrative password. This is pretty much everything that readers need to know about F-Secure parental control. Readers don’t need us to tell them that the F-Secure parental control system is pretty much local-only to the computer it is installed on. Moreover, in terms of the number of features, it is pretty barebones. Additionally, the F-Secure parental control system does not produce any kind of reports for the parents on what their children have searched for or have seen on the internet. It doesn’t even inform the user of the websites it has blocked for them to protect their kid. At the other end of the spectrum, we have Kaspersky and Bitdefender. Both internet security suites offer a ton of features with their dedicated parental control systems. In fact, we believe that their parental control components can even rival what users are likely to get even from the top standalone parental control products. By contrast, F-Secure only has the muscle to offer a solution that is Windows-only. The F-Secure parental control system is unique in the sense that its configuration system is very awkward. We know of many features of the F-Secure parental control system that don’t really work when it comes to unknown web browsers. Older kids who have a sense of how computers work and have administrative privileges can easily bypass anything and everything the F-Secure parental control system throws at them. But let’s have a fair judgment here. As far as F-Secure Safe is concerned, its parental control system is cross-platform, modern and offers a remote management dashboard system. Users who install F-Secure Safe on a machine with Windows on it, will find that it supports much of the same features that come with F-Secure Internet Security (the product that we have tried our best to review here). The thing F-Secure needs to realize here is that modern parental control systems have to have remote management features. Most of the modern online consumers wouldn’t know anything about bloated and slow security dinosaurs that sucked up the user’s system resources. Thankfully, they are long gone. So there is no need to talk about them. What we actually want to talk about here is how most modern security suites and other products have improved from having negligible system performance pact to normal performance impact. Of course, it is always a worthwhile task to just run a few of the simple and old performance impact experiments. The thing about measuring performance system is that, the final results depend a lot on the test system. Some testers may use an old and underpowered computer system in order to really gauge the performance impact of a given security product. For example, a Sony VAIO that can only run Windows XP official Media Center can’t really tell you how heavy a modern security product really is. So it is best to let these old systems die in peace. Most testers nowadays prefer to test security products with newer systems like one of the latest editions of ASUS laptops. Besides, the final performance impact scores are basically percentage changes from the machine’s baseline performance. The result doesn’t really have anything to do with raw numbers. In other words, there isn’t a huge change if a given tester goes from an older machine to a newer machine for testing the performance impact of a given security product. The first thing that gets affected when someone installs a security product on a system is the boot time of the system. So let’s figure out a way to measure the change in boot time before and after a security product got onto a given system. The best way to start is to use a script that has the ability to launch right at system start up. Ideally, it should wait for around 10 seconds and allow the CPU usage to fall below the five percent mark. That is the perfect time for the tester to consider the machine as fully ready for functioning. Windows has a feature where it can report the start of the actual boot process. Subtract that from the previous number and one can yield the real boot time. Of course, the way to go about is to average out the results of multiple runs. First, the tester has to start the machine with no suite. And then, a multiple number of reboots with the suite installed. Our research shows that F-Secure, when installed on a given test system, increases the boot process time by a reasonable 25 percent. Users need to understand here is that if they run F-Secure on a fairly new and quick machine, the 25 percent increase in boot time means a total of 8 seconds. Needless to say, that 8 seconds is hardly noticeable. The majority of computer users in the modern world tend to allow their machines to go into sleep mode especially when they are not using the machine. They only reboot their machines when they have no other choice. In that respect, an increase in the machine’s boot time is now no more an irritant like it used to be in the past. However, if a security product (after being installed on a system) affects the day-to-day computer file manipulation and other activities then that could prove as a real drag. How to test for that? Well, the best way is to run a special script that has the capability of moving and then copying wide-ranging collection of folders and files between the machine’s drives. Our research shows that such a script would show around a 20 percent increase in the time the machine required to do the task with F-Secure on the system than without it. That figure may not sound like a lot. But when compared to the competition, it is considerable. However, it still doesn’t reach the “bad” level. As for zipping and unzipping files multiple times, our research shows that F-Secure affects that by only 1 percent. If we average out the results F-Secure manages to put up, we would like to give F-Secure a score of 15 percent. That means, F-Secure hits a given machine’s performance by 15 percent. Where does that put F-Secure’s score? It puts it just under the average of what other top security products offer. Now, that may sound reasonable. Because security products such as Norton, Webroot, and adaware antivirus total have a performance hit percentage of exactly zero. It F-Secure Internet Security doesn’t do radically different, there is nothing stopping it for going out. In fact, at the time of writing this review, our research shows that it has become rather difficult for users to even download the product and then install it on a machine. 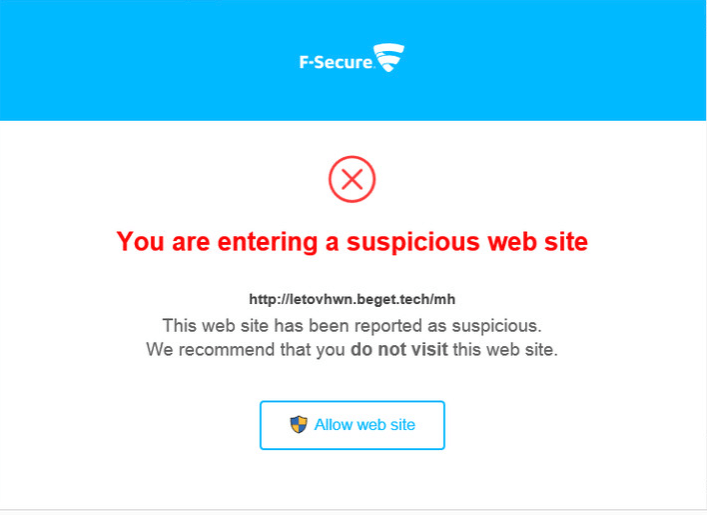 Well, because when you go to F-Secure’s official website, it conveniently redirects the user to the company’s more capable and comprehensive F-Secure Safe offering. This tells us that the company is all set on abandoning this product. Users who are already using F-Secure Internet Security should continue the cycle of upgrading. However, the better option would be to switch to F-Secure Safe. As far as this product is concerned, its antivirus component is still strong enough to score decent marks in the different independent testing lab tests. Our research also shows that this security suite has a capable antivirus component. The web browser protection that F-Secure Internet Security comes with has enough about it to ace various malicious URL and/or website tests. It doesn’t do quite as well on protecting users against phishing attacks. The parental control system is limited and awkward in a unique sense that it makes it difficult for users to configure it from a single device. We know that plenty of online consumers aren’t exactly die-hard F-Secure Internet Security aficionados. To such users, we say that they should stay away from it. As far as the entry-level internet security suite arena goes, there are more capable offerings in the form of Kaspersky and Bitdefender. And bot comes with a considerably broader feature set when compared to F-Secure. Kaspersky and Bitdefender both have fully realized parental control systems. On top of that, both offer enough to score excellent marks from all antivirus independent testing labs.